Lunch (almuerzo) is the main meal of the day in Peru and a great time for travelers to sample some of the nation’s traditional dishes. Lunch in Peru begins between midday and 1 p.m., a fact reflected in business opening hours. It’s common for shops and offices to shut at midday, with employees returning to work as late as 3 p.m. Many Peruvians head home for lunch, but you’ll find plenty of lunchtime options in all but the smallest of villages. Ceviche is traditionally a lunchtime dish, with midday being the best time to settle down in a cevichería for a feast of lime-marinated seafood. Streetside restaurants and bistros provide good people-watching opportunities but prepare to pay well above the norm in tourist-orientated establishments. Peru is also home to numerous Chinese restaurants, known as chifas, where you can buy vast plates of well-prepared and inexpensive food. If you don’t have time to sit down and indulge, you can pick up some traditional Peruvian snacks on the fly. Empanadas, tamales, humitas and juanes are great for stuffing into backpacks before jumping on a bus. For budget travelers in Peru, it’s hard to beat the set lunch menú, a Peruvian lunchtime option that deserves a section of its own. As you stroll through the streets of Peru in search of lunch, you’ll notice a large number of signs saying “Menú.” Whether in front of a top-end restaurant or beside the front door of what looks like a regular home, the sign is inviting you in for a set lunch meal. In terms of value for money, the Peruvian set lunch is hard to beat, especially in family-run establishments frequented by regular Peruvians. The lunchtime menú is common throughout Peru, from the big cities to even the smallest towns and villages. The meal consists of a starter, a main course, a drink and sometimes a small dessert. You’ll normally have two or three starters to choose from and a wider selection of main courses. The menú is a blessing for budget backpackers. 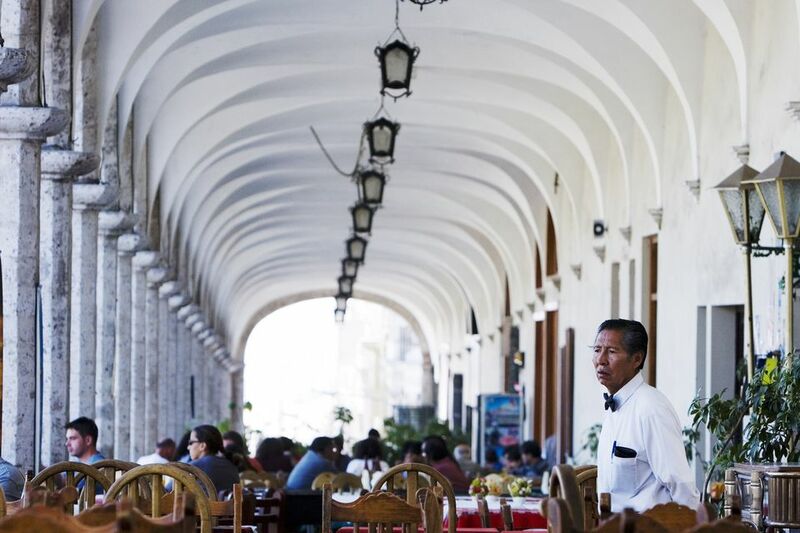 If you’re traveling in Peru on a budget, avoid set lunches in upscale restaurants and head to smaller establishments. The decor may be lacking, but a two-course meal, with drink, included, for as little as US $1.50 is nothing to sniff at. There are, however, a couple of points worth mentioning about the Peruvian lunch menú. Considering the price, the food is often surprisingly good -- but it can also be shockingly bad. Unless you want a chicken foot in cold water followed by a plate of beans and a bone, always buy your menú in a reasonably busy establishment. The locals know where to eat, so treat empty tables as a warning sign. Finally, set lunches begin at about midday and finish at around 3 p.m. After 1 p.m., the main course options will slowly start to dwindle, leaving you with the less popular choices. For fresher food and a greater selection of dishes, try to eat lunch between midday and 1 p.m.
Peru has a vast array of typical lunchtime dishes, so the selection process can be a bit complicated, especially if you don’t speak Spanish. Here are a few starters and main courses that often appear on Peruvian menús.